This Outlook better represents the conditions we are seeing, both up the North Fork as well in more severe burning conditions across the rest of Montana. 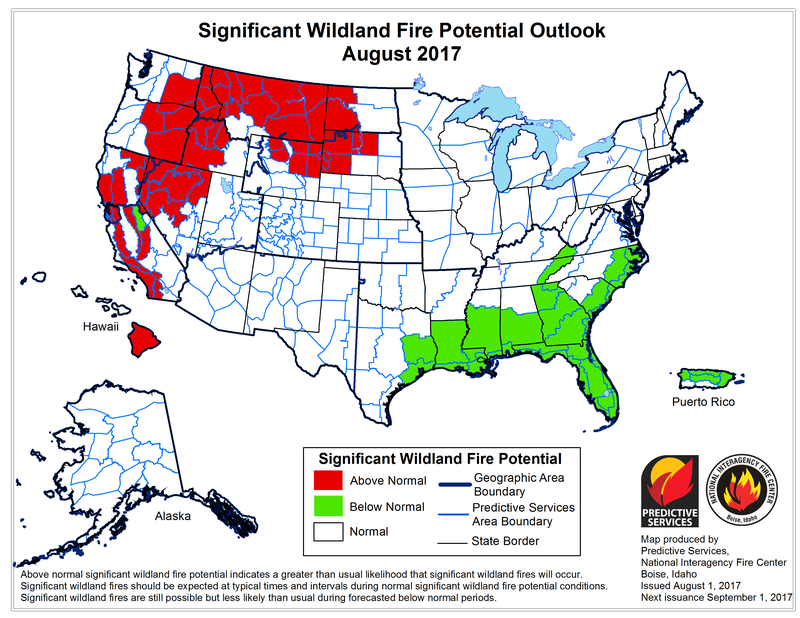 This is in sharp contrast to the forecast from Predictive Services we received at our IMT Spring Meetings which forecasted a “slow normal” fire season for the Northern Rockies. I think we have exceeded the acres burned by August 1 that they forecasted for the entire season – and you all know that we have six to eight weeks of fire season left. I just returned yesterday from a 12 day assignment as Deputy Plans Chief with Shawn Pearson’s North Idaho Type 2 Team on the Sunrise Fire outside of Superior, Montana. Doug Turman’s Type 1 Team replaced us, because it is truly a Type 1 Fire. Pearson’s Team had been assigned several days before I was ordered – I was one of the folks they ordered to expand the Team’s capability to manage a complex incident. The fuels in Southwest Montana are extremely dry. Operations did an incredible job burning out heavy fuels around structures that had been evacuated. As I left yesterday, the Team had not lost a structure, which was incredible as well. Our fuels in the mid and higher elevations in the Flathead are retaining more live fuel moisture, but that may not last long if the heat does not moderate. This is very similar to the 2007 fire season where the Flathead saw large fires – Brush Creek west of Whitefish in Star Meadows, and Skyland Creek Fire in the Skyland Creek area that burned over Marias Pass through the Lewis and Clark National Forest, and onto the Blackfeet Reservation. The North Fork dodged the bullet in 2007. I hope we are as fortunate again. Anyway, I’m thinking I may not have much time up the North Fork until after the season ends. And I wouldn’t expect that until October 1 at the earliest. We all know they can extend with nice fall weather as well.